The primary purpose of a sous vide machine is to keep the water bath at an accurate and consistent temperature during the cooking period, whether that's minutes, hours or days. However, there are occasions when the temperature of the water bath needs to be increased significantly - one of those is during startup. This post will address the question of how long this startup time normally takes. First, I will describe the various factors which impact the length of this startup time. Then I will introduce the Sous Vide Machine Benchmark I have developed and summarize the startup time information I have measured. During startup the water in the bath needs to heated until it reaches the target temperature. The amount of time required to change the temperature in the bath depends on a number of factors described below. The quantity of water the sous vide machine needs to heat greatly impacts the amount of time required. The different types of sous vide machines apply heat to the water in the bath using different techniques. Immersion circulators place the heating element directly in the water and pump water through it. The flow of the water also circulates throughout the water bath container resulting in a consistent temperature in the bath. Water ovens typically heat the container itself and depend on conduction to transfer the heat from the walls and bottom of the container to the water. Convection then assists in distributing the heat more evenly throughout the water bath. The amount of power used by the sous vide machine, and how efficiently that power is applied to warming the water, will impact the amount of time to bring the bath up to the target temperature. Given heat sources of the same type, the one capable of outputting more power will heat the water quicker. The thermal characteristics of the water bath container also impacts how quickly the water can be heated. If heat from the water is lost through the walls or top of the water bath container it will take longer to heat the water to the target temperature. Consequently, the startup time can be reduced by insulating the walls of the container and covering the top. Looking to Up Your Sous Vide Game? 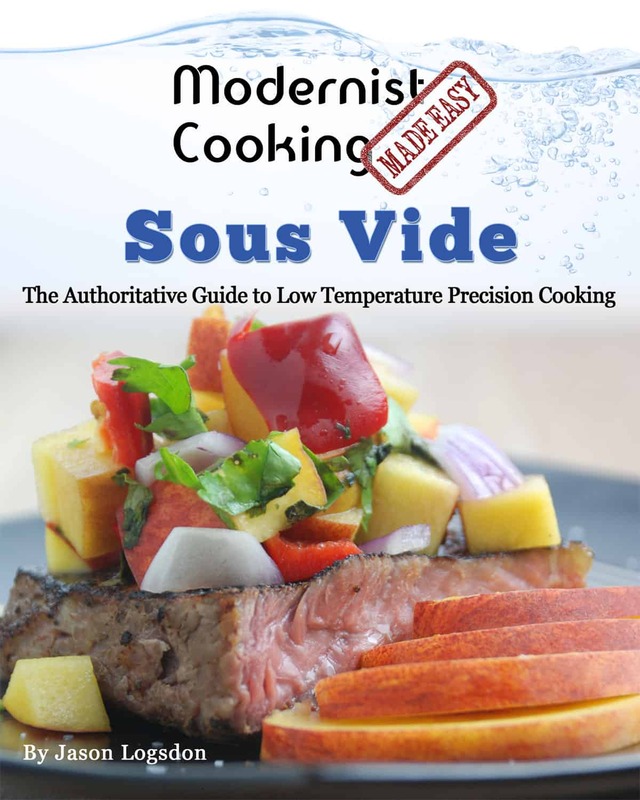 My best selling sous vide cookbook has helped more than 20,000 people up their sous vide games and was recently highlighted by Michael Ruhlman as a great sous vide resource. 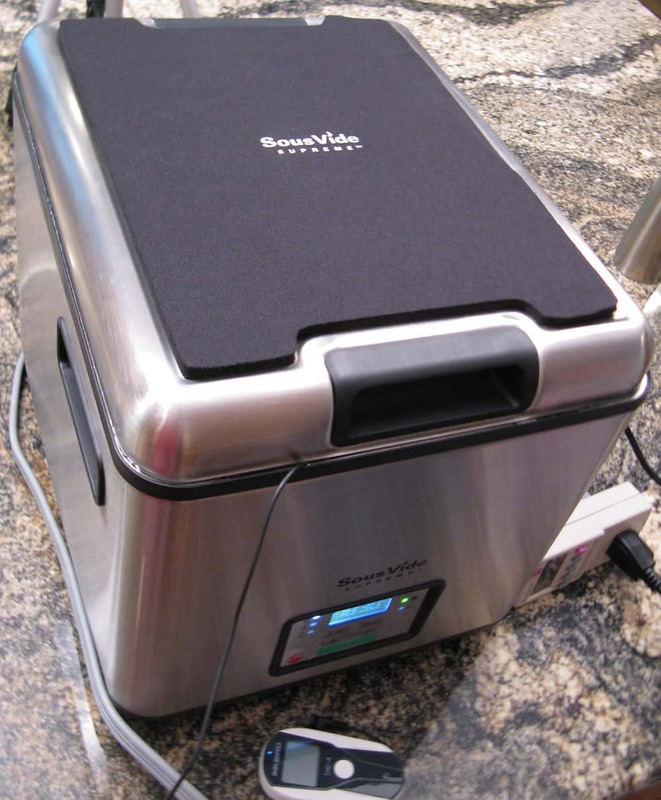 It will help you master sous vide and act as as a reference for more than 80 cuts of meat and vegetables. It is also filled with inspiring recipes to get you on your way to sous vide success! In addition to those factors mentioned above, which impact how quickly the water can be heated, there are other factors that impact the startup time itself. The amount of time to reach the target temperature clearly depends on the temperature at which you start. If you have just filled up the water bath with hot water from the tap, you are probably starting around 125°F (51.67°C). If, however, your sous vide bath has been sitting around a while at room temperature you're probably starting more like 75°F (23.89°C). The higher the target temperature, the longer it will take to be ready to cook. If you plan to cook something like beef, pork, or fish to a "medium", a typical target temperature would be 140°F (60°C). If you plan to sous vide vegetables or fruits the target temperature is significantly higher, around 183°F (83.89°C). I have developed a benchmark to gather objective performance data on a variety of sous vide machines. 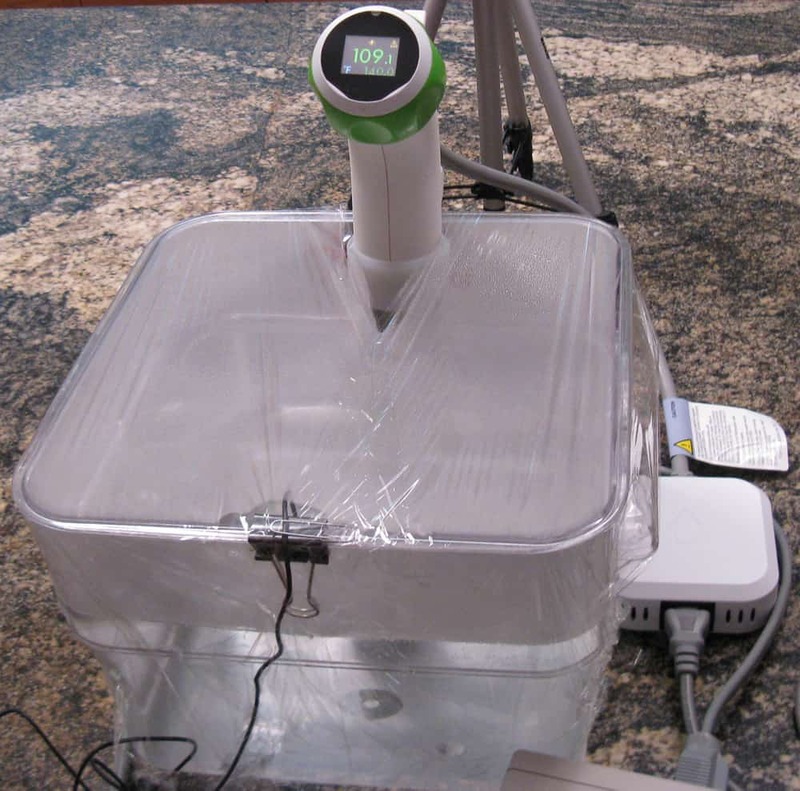 The Sous Vide Machine Benchmark is described in detail in this blog post. One of the parameters measured by the benchmark is the time to bring the water bath up to the target temperature of 140°F (60°C). There are actually two different times recorded: the "Room Temperature Startup Time" and the "Hot Tap Startup Time". The former measures the time to go from 75°F (23.89°C) to 140°F (60°C), the latter from 125°F (51.67°C) to 140°F (60°C). The first 60 minutes of the Sous Vide Machine Benchmark is the Startup Phase. The sous vide machine is filled with 8 L (2.11 gals) of water at room temperature. The machine is then turned on with the target temperature set at 140°F (60°C). The temperature of the water bath is then recorded every 10 seconds so that the two startup times can be measured. As mentioned above it depends on a wide variety of factors. Even when looking at the results of the Sous Vide Machine Benchmark, in which many of the factors are kept constant for each sous vide machine being benchmarked, the startup times vary quite a bit. This is due primarily to the type and power of the sous vide machine being measured. 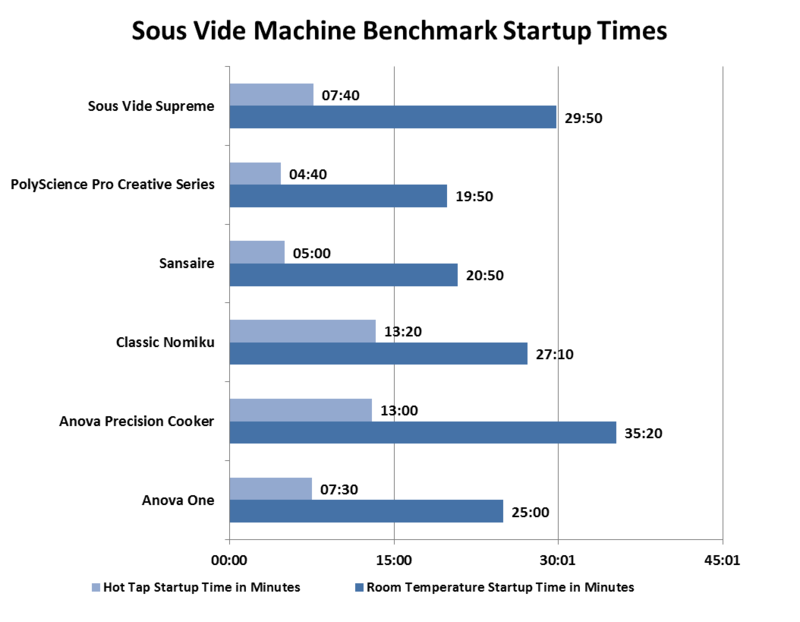 The chart below summarizes the startup times of the various sous vide machines benchmarked. Both the "Hot Tap Startup Time" and "Room Temperature Startup Time" are displayed. Note: For an up-to-date look at the results of our latest tests including several new sous vide machines, you can read our sous vide benchmark results article. Overall the startup times do not vary widely. Approximately 15 minutes for the Room Temperature Startup Time and about 8 minutes for the Hot Tap Startup Time. If you want to reduce your startup time then it makes sense to fill your sous vide machine with hot water from your tap. This can significantly reduce the length of time for the water bath to reach the target temperature. The PolyScience Sous Vide Professional Creative Series is the fastest of the sous vide machines to get to the target temperature. The Sansaire Sous Vide Immersion Circulator is hot on it's heels - and at a much lower price. 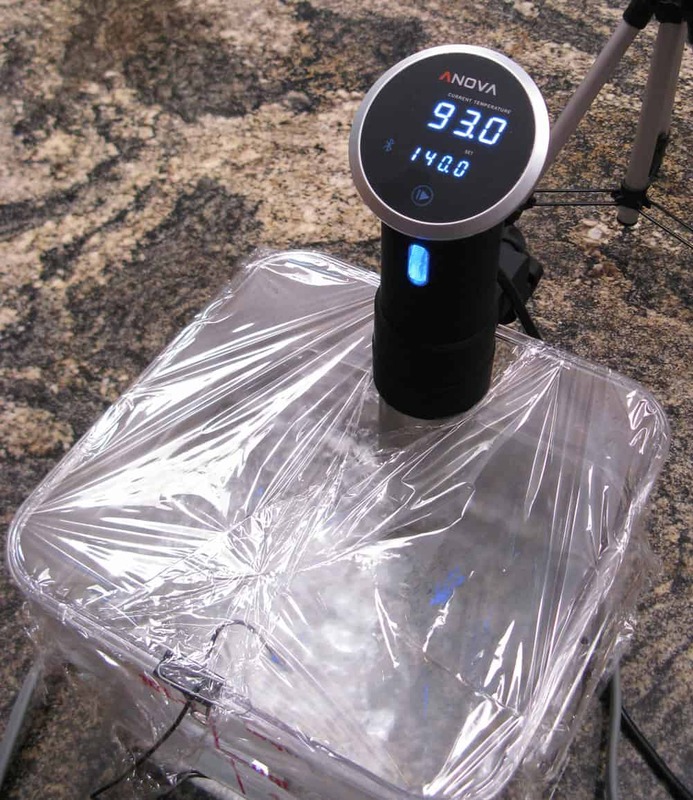 The Anova Precision Cooker comes in with the slowest startup times of the sous vide machines we benchmarked. This is a result of the design decision to reduce the unit's power from 1000 watts (Anova One) to 800 watts. Remember that these typical startup times will vary depending on a number of the factors listed above. Also, with few exceptions there's no reason to wait until the water bath reaches the target temperature before putting in the food to be cooked. The exceptions would include foods with very short cooking times (less than an hour) such as eggs, fish, and some fruits and vegetables. You can see the details of how these startup time measurements were taken on the Sous Vide Machine Benchmark post along with numerous other pieces of interesting information. What has your experience been with startup times? Have you developed any tips or tricks to make startup times less important? Please share your thoughts in the comments.